The 5.4 magnitude earthquake suggests that even small volumes of water can trigger large events. Earthquake damage following Nov. 15, 2017 Pohang earthquake. (Inside Science) -- Pumping water into the ground at Pohang, South Korea, shouldn't have been dangerous. The power company used only small amounts of water for their enhanced geothermal project -- far less than the volume believed to pose a serious earthquake risk. But on Nov. 15, 2017, the most damaging earthquake the nation has seen in more than a century struck the town, injuring 90 people and causing $52 million worth of destruction. Two studies published today in the journal Science suggest that water injected about 2.7 miles underground was indeed to blame for the 5.4 magnitude quake, which would make it the largest earthquake ever caused by activities related to geothermal energy production. The findings may prompt experts to re-examine the risks posed by injecting water into the Earth, which is part of several types of energy development. Geologists have long known that water injected deep underground can trigger earthquakes, seeping into faults and allowing them to slip. Nevertheless, water injection is used in several industries, including fossil fuel extraction and geothermal energy. Some of the largest induced earthquakes have occurred in Oklahoma, including a magnitude 5.7 quake that struck the central part of the state in 2011. The primary cause of the Oklahoma earthquakes is believed to be the injection of huge volumes of wastewater produced as a byproduct of extracting oil and gas. Smaller earthquakes have also been triggered around the world by the process known as "fracking," or injecting water at high pressure in order to create cracks. In the fossil fuel industry, these cracks act as channels through which oil can flow. Rather than extracting something from the Earth that is later burned to produce energy -- and greenhouse gases -- geothermal is a renewable energy source that directly taps into the Earth's internal heat. Usually, companies drill to where it's hot, then use water or steam that rises from the well to drive turbines. The best spots for geothermal energy tend to be right around volcanoes, where companies can sometimes find extremely hot water flowing naturally through permeable rock. But recently, some geothermal companies have turned to fracking to extract heat out of less favorable sites. To build what they call enhanced geothermal systems, companies create a network of cracks between two wells, then pump water down one well and extract it from the other. Developers planned to use this kind of geothermal fracking at Pohang to create the nation's first geothermal power plant, but the 2017 earthquake brought the project to a halt. 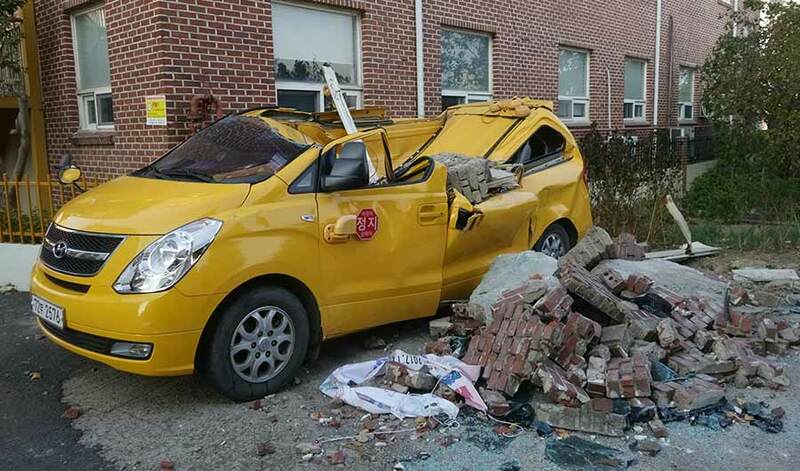 Kwang-Hee Kim, a seismologist at Pusan National University in Busan, South Korea, first began scrutinizing the Pohang region in 2016, when a large earthquake that he believes to be natural struck about 25 miles from the town. When he examined data from seismic sensors, he noticed that the ground beneath Pohang itself was acting restless, in sharp contrast to its stillness of prior years. "There were no earthquakes before 2015 in this area," said Kim. "There was no background seismicity. But after they completed production and injection wells, we started to have minor earthquakes." Most of the earthquakes at Pohang originated at depths of just 2.5 to 4 miles, shallower than the 6 to 12 miles typical of natural earthquakes in the Korean peninsula. Moreover, these shallow earthquakes tended to occur at the same time water was being injected to crack the rock. In 2017, Kim set up a denser network of sensors right at the site of the unusual activity. Five days later, the 5.4 magnitude quake struck. "He was very lucky that his network was up and running when the main shock occurred," said Bill Ellsworth, a seismologist at Stanford University who is working on an in-depth investigation of the Pohang earthquake funded by the South Korean government. "That allowed him in this paper to very precisely determine where the main earthquake initiated." The center of the earthquake turned out to be almost exactly at the bottom of the geothermal wells, both in location and depth. The seismic data also revealed a previously unknown fault system. "Apparently they injected the water right on top of the fault zone," said Kim. Another study in today's issue of Science yielded essentially the same findings, although with less spatial detail. That study, conducted by Francesco Grigoli of the Swiss Seismological Service at ETH-Zurich and colleagues from several European institutions, relied on publicly available seismic data, as well as satellite measurements showing how the ground shifted during the quake. According to Grigoli, researchers still can't rule out the possibility that the earthquake was natural, occurring in the same place as the injection wells through sheer coincidence. But Kim views the chances of such a coincidence as miniscule. "I'm very confident that this earthquake was influenced by the EGS [enhanced geothermal systems] activity in the area," said Kim. If the enhanced geothermal project did cause the Pohang earthquake, it could change the way researchers think about induced earthquake risk. When Kim applied a popular formula for estimating the maximum possible size of induced earthquakes, he found that triggering the Pohang earthquake should have required more than 800 times more water than was actually used. That suggests that models for estimating the potential size of induced earthquakes should consider not only what humans inject, but also the underlying pressures and geometry of the fault. "Fluid injection just provides a triggering mechanism," said Kim. Because quiescent faults can sometimes be invisible, that might mean that small injection projects could trigger virtually any size of earthquake, if water injections were unlucky enough to reach a dangerous fault. Only a very small fraction of injection projects in either the fossil fuel or geothermal industries ever lead to problems, noted Wilfred Elders, a geophysicist and professor emeritus at the University of California Riverside who is working on another kind of geothermal project. Even so, it may be possible to conduct injection projects more safely. One option is simply to locate injection wells in areas where earthquakes would be less harmful, far from urban centers like Pohang, said Ellsworth. Kim suggests another strategy: paying attention to the Earth's warning signs. The Pohang fault gave plenty of warning trembles each time it was doused in water, he said. Perhaps if people had heeded those signs, they could have stopped the project in time.